When people ask me why I became a medievalist, I tell them the truth: I didn’t know any better. I didn’t realize I was signing my mind away to white men. I was recently in my hometown of San Francisco, walking through the Mission district on Christmas Eve looking for a place to pop into and get some work done. I had some grading to finish for my Chaucer class. I worked for a bit in a café at Valencia and 24th St. But when it closed early at 4pm, because of the holiday, I made my way toward the local library a couple blocks away. The Mission branch library is in a beautiful two-story stone building and so I looked up to admire it for a moment, to etch it into my memory as best as I could. I find myself doing this more and more every time I go back home. It’s a way of holding onto the past, to an old San Francisco that seems buried now, much of it lost to the gentrification of the tech industry. Every time I return home, I find more locals displaced, more empty storefronts, the homeless population steadily increasing. But this library building stood there unchanged, a staple of the community and a refuge for the kids in the neighborhood. As a kid in my own neighborhood in the Outer Sunset (a district of predominantly working-class Asian immigrants that has only recently felt the effects of gentrification), the local library was our daily rescue from home and after-school trouble: we would do our homework, make prank calls on the payphone outside, play ping pong at the adjacent community center. Though we didn’t realize it at the time, that library helped shape us and who we would become. I wondered about the Mission library now, at the cusp of 2019, and how it fits into one of the most gentrified neighborhoods in the city. As these thoughts flashed through my mind and I gazed up at the stone building in front of me, I noticed something that I had either never seen before or hadn’t thought remarkable enough to remember. But this time, it was remarkable. 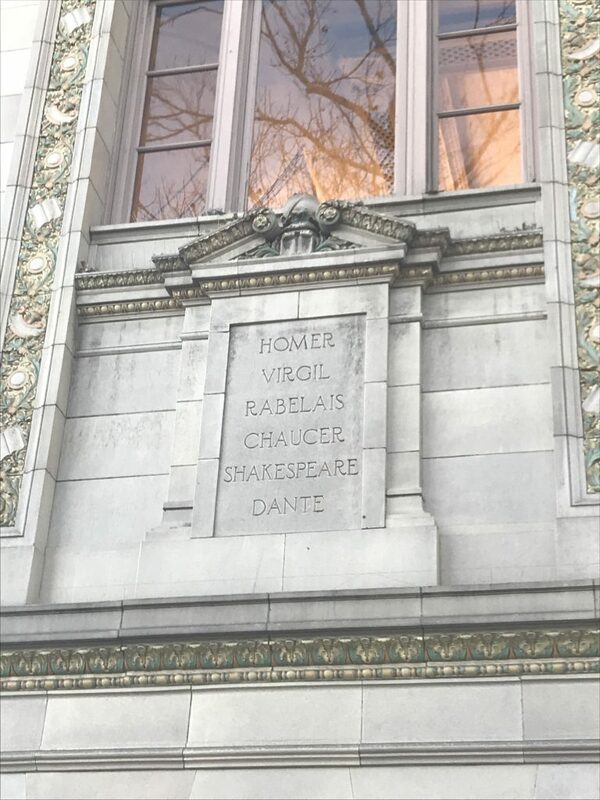 Wrapped around the face of the building were etchings of names, six per column, and the first read: Homer, Virgil, Rabelais, Chaucer, Shakespeare, Dante. My eyes followed the carved words around to the side where they ended, each name digging a pit deeper into my stomach. Here I was, in the heart of the Mission, a Latinx neighborhood for as long as most San Franciscans’ memories can reach back to, and a building that is meant to represent knowledge, learning, community, safety. . . is encased with the names of white men. I wanted this old stone building, this old library in the Mission, to offer me some solace amidst a devastating present, to remind me that knowledge, education, and learning are paths out of socio-economic oppression. Instead, it reminded me that those paths too often lead us toward our own epistemological oppression—and do too little for the places and people we came from. The façade of the Mission library reminded me that those paths belong to white men; the rest of us merely walk them. To be deemed educated or intelligent in our so-called western society, one must aspire to know and master what white men know and have known. It’s fine to know other things too, but all of that is extra. When people ask me why I became a medievalist, I tell them the truth: I didn’t know any better. I didn’t realize I was signing my mind away to white men. I believed I had a place in any field in which I took a liking and I liked medieval literature. I believed that if I learned the skills and was trained well, I could be a scholar of medieval literature just like anyone else. But what I learned along the way is that only white men will ever be perceived as fitting. Others can join them, can even gain as much success, but we will still never “look the part” because yes, the part does have a look. I stepped into the Mission library to find a place to finish grading. At one of the long reading tables in the center of the second floor, I opened up the folder with my students’ final projects: creative adaptations of The Canterbury Tales. When I teach Chaucer, I like to do so with adaptations because it is the best way I know how to make his corpus take up less space while at the same time show its relevance to our modern lives. Adaptations offer me an entry point for thinking about the relation between canon formation and epistemological colonialism. They help me structure a syllabus and learning environment that resists the authority of a white male canon. The adaptations I teach bring in a multiplicity of perspectives and vantage points, and are one small way I can show my students that it is not only to white men that we should seek knowledge. We can appreciate the brilliance and aesthetic beauty of Chaucer’s work without suggesting it stands above the rest. My students learn that the main reason why Chaucer is deemed the “father of English literature” is because the English literary canon was produced within and sustains a white patriarchy. For me, as a professor who teaches Chaucer, it is my job to show students how our reverence for whitewashed literary histories must be taken down. I can’t look around at the devastating effects of modernity, like the gentrification of my home town, and let what I study and teach—what I do every day—evade it all. Because of course how we teach and produce knowledge about the past affects our present. All knowledge is subjective, and even in historically white fields like medieval literature, white male subjectivity needs to stop dominating our epistemologies. 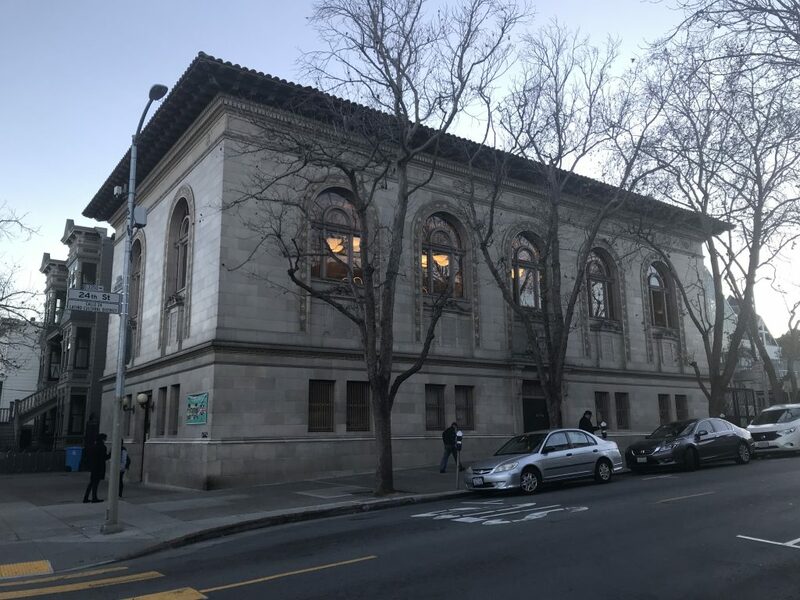 UPDATE: Since writing this essay, I learned that the Mission library is slated for renovations that could close its doors for two years, with no replacement during that time. Welcome to the Public Discourse page. 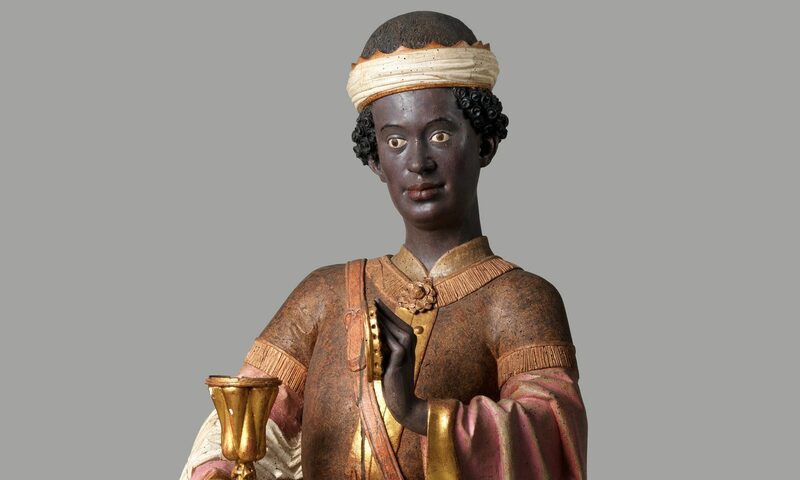 We offer this blog as a space that centers the perspectives, experiences, and voices of scholars of color who work in Medieval Studies. While official statements issued by MoC will be posted on our Statements page, this space will be open for the dissemination of individual blog posts: short essays and musings on current events related to the study and/or appropriation of the medieval past. The aim is to foster public dialogue on issues that affect the future of Medieval Studies while maintaining a central commitment to anti-racist practices and epistemologies. MoC’s Editorial Committee will manage the blog without laying claim to the viewpoints expressed here. If you are a scholar of color or non-POC ally who would like to post on this blog, please email us and address your inquiry to the Editorial Committee. MoC will also use this space to make announcements, share news, and periodically post bibliographies that list new publications by medievalists of color. In serving this latter purpose, the Public Discourse page contributes to the field’s recent movement to decolonize our citational practices. If you are a medievalist of color and would like MoC to include a citation of your scholarship or a link to a public essay you have published elsewhere, please email us and address your inquiry to the Website Committee.